Quality, elegance and ease of operation are the mark of all HeartWood windows. 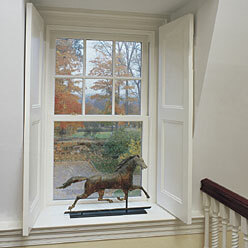 HeartWood manufactures single hung, double hung, and triple hung windows with nearly endless design options. Classic concealed balances will lift individual sash weighing up to 90 lbs. Traditional weight & chain balances are available for sash of practically any size or weight. Wood or aluminum framed screens are available, as well as concealed roll screens.